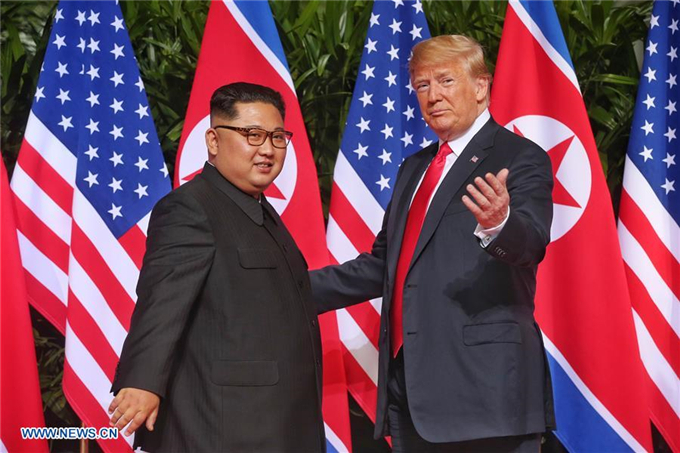 Top leader of the Democratic People's Republic of Korea (DPRK) Kim Jong Un and U.S. President Donald Trump signed a "comprehensive" agreement here on Tuesday afternoon. At the signing ceremony, Trump said it was "a very important document, pretty comprehensive document." Kim called it "a historic document," saying the two sides will "leave the past behind" and the world will "see a major change." Asked about denuclearization of the Korean Peninsula, Trump said: "We are starting that process very, very, very quickly, absolutely." He said the United States' relationship with the DPRK and the Korean Peninsula "is going to be a very much different situation than it has in the past." Earlier in the day, the two leaders held a 40-minute meeting one on one with only their translators at their side, before their entourages joined them for a larger meeting and a working lunch. After the signing ceremony, Kim is expected to fly back home in the afternoon, while Trump will give a press conference before leaving Singapore.